We are nearing the light at the end of the tunnel as the finals of the A Block will take place this morning as the G1 comes to Sumo Hall for three straight nights. Only two people are alive in the block, and coincidentally both are in the main event as Hiroshi Tanahashi will battle Tetsuya Naito. In their last meeting earlier this year, Tanahashi beat Naito to win the IWGP Intercontinental title. Will Naito get his revenge, or will the self-professed ace of New Japan Pro Wrestling claim another victory? Though Tanahashi vs. Naito will determine the winner, other A Block matches will also take place. The final matches in the block include Kota Ibushi taking on Hirooki Goto, Bad Luck Fale facing Yuji Nagata, Togi Makabe squaring off against YOSHI-HASHI, and Tomohiro Ishii vs. Zack Sabre Jr. in a rematch from last month’s great bout in Long Beach. Join us for live coverage this morning at 5:30 a.m. ET. The show will feature English commentary by Kevin Kelly, Don Callis and Rocky Romero. This was fine. One thing I noticed is that even though Kitamura is still a young lion, he’s given more spots to look good. Suzuki nailed Kitamura with hard slaps, but countered with a suplex. Kawato came in and looked pretty good, but eventually was taken out by Desperado and was pinned with the angel’s wings. A pretty decent tag team match. SANADA came off as such a superior athlete. GoD hit the Guerilla Warfare but SANADA broke it up. Tonga quickly finished things back in the ring as SANADA was taken to the outside as he quickly pinned BUSHI with the gun stun. Another good tag team bout. Robinson and Kojima worked well as a team, which played into the match. Robinson blasted him with a lariat and finished with the pulp friction for the win. EVIL and Kojima had a staredown after the match. This was a really fun match, full of fun dives and energy. Ricochet did a dive on the outside, wiping out all of Bullet Club. Elgin followed, then Hanson was going up top when the Bullet Club cut him off. Cody missed the moonsault, but missed. Same thing for Hangman Page, then the Young Bucks. After Chase Owens missed his attempt, Hanson went on top and landed one of his own. Ricochet wiped out Bullet Club on the outside following the Sasuke special. Elgin finished off Owens, hitting the Elgin bomb for the win. This really didn’t last long. The commentators put over that Okada may be injured going into the match against Omega tomorrow as his neck was all bandaged up. Omega and Okada battled on the outside as Yano did his usual business in the ring against Yujiro. He eventually finished the match the same way he’s done all tour: distract the ref, low blow, roll up pin. This was great. Since this was Nagata’s last G1 match ever, people were into the idea of him winning and were with him from the start. Fale dominated early, taking him out of the ring and choking him on the mat. They teased a countout spot, which had fans frenetic, but he made it to the ring in time. Nagata fights back, targeting a leg. He soon was able to follow with an exploder after initially being unable. Fale clubs him with punches as he attempts to gain control again. He goes for the grenade, but Nagata grabs the arm and sinks in the armbar. Nagata transitions into an ankle lock, then follows that with the Nagata lock. Nagata hits a knee in the corner and hits the backdrop driver, but Fale kicks out. Fale soon countered with a spear. He went for the grenade, but Nagata escaped. Fale hit a clothesline and followed with the Bad Luck Fall for the win. Bad Luck Fale held up the too sweet sign after the match in a show of respect. Nagata opted to throw his signature hand sign instead. Fale bowed in a show of respect as he left the ring. Nagata (as well as announcer Shinpei Nogami) was clearly emotional as a bunch of people held up Blue Justice posters. He made his exit, his music playing. This was pretty good. The work was good, plus the crowd were hot for everything which helped a lot. Mostly some nice back and forth during the bulk of the match. Makabe looked to go for the knee drop but YH moved out of the way and followed up with the lariat. He went for the butterfly lock, but Makabe powered out. Makabe made a comeback, fought YOSHI-HASHI on the top rope then hit the spider suplex. He followed up with the King Kong knee drop for the win. This was a rematch from the IWGP US title tournament in Long Beach, and it was near the same high standard of their first meeting. Sabre tried to start with mat wrestling, but Ishii was able to counter him until they stood up. They went back to the mat, where they again reached a stalemate as ZSJ bridged up. He delivered an uppercut as Ishii invited him to try some more strikes. Ishii struck back and laid Sabre out after he obliged. Ishii gained control with strikes, chopping Sabre against the ropes and into the turnbuckle. Sabre fired back by Pele kicking his arm and taking him down. He began to focus on the arm and wrist while applying pressure to it. Ishii was eventually able to counter with a back suplex and gained control again until Sabre got a choke in the ropes and applied an armbar. Sabre worked on the wrist and bent it back, but Ishii was able to grab the ropes. Sabre hit kicks to a kneeling Ishii, with Ishii again inviting him to strike as he made it back to his feet. Ishii hit him with a punch, but Sabre replied by grounding him with a dropkick to the legs. After getting back on offense, Ishii hit a brainbuster off the top rope for two. Sabre went for a submission before Ishii threw him into the turnbuckle from a fireman's carry position and hit a German suplex. Ishii got two off of a powerbomb, but it allowed Sabre to reverse into a triangle. Ishii tried to power up, eventually laying out ZSJ with a lariat. He went for another before ZSJ got a choke, transitioned into a slam, and hit a penalty kick for two. As Ishii tried to kick out, ZSJ maintained the upper hand by putting his bad knee in a kneebar. Ishii got to the ropes, but Sabre kept focusing on the knee with stomps to the back of it. Ishii slammed his own head into the turnbuckle a few times as he tried to work through the pain. He dared Sabre to keep kicking him, and floored him with a chop when he did. Ishii connected with punches and went for a dragon suplex, but ZSJ countered into a pin for a near fall. He put on an ankle lock while also wrapping his leg around Ishii's bad knee. Ishii got an ankle lock of his own, hit Sabre with a headbutt to the chest, and followed with a lariat for a near fall. Sabre countered Ishii into a head and arm submission when he went for the sliding D. Sabre kept Ishii from the ropes and switched to focusing on Ishii's better leg while also delivering kicks to his back. He didn't tap out, but the referee called for the bell as Ishii passed out. Goto took out Ibushi early with a clothesline on the apron, sending him to the barricade. Ibushi soon fought back, landing some good offense and hitting the standing moonsault for a near fall. Ibushi hit a German suplex, but Goto fired right back with a clothesline. Ibushi escaped Goto’s clutches from the top rope and hit a Pele kick. He goes to the top, but Ibushi is met with resistance. Goto fights back, sending him down to the floor, but counters by hitting a hurricanrana off the top rope. Goto caught Ibushi, but him in the Samoan driver position and hit the ushigiroshi. Goto followed with a big penalty kick. Goto takes him up, but Ibushi counters with a roll up. Kamigoye attempt by Ibushi, but Goto maintains wrist control and hits a reverse GTR, then the real thing for the win. This was another really good, borderline great match. The announcers speculated after the match where Kota Ibushi would go next. They did bring up the win against Hiroshi Tanahashi, making it at least plausible he could be contending for that title next. This was an excellent back and forth main event, expertly showcasing the great chemistry they have with one another. I’d have to go and rewatch their match from Dominion, but I think both matches were about on par with one another. They took it to the ropes early, where Tanahashi hugged Naito, I guess in a psych out spot. Tanahashi slapped Naito, setting the tone of the match. Naito went to do his pose in the middle of the ring, but Tanahashi, who was on the outside, came back in and started to stomp on him. Naito soon found an opening with Tanahashi’s hurt arm. Tanahashi fought back, leading to a series of great offense. Tanahashi misses the senton off the middle rope, but takes out Naito, sending him to the outside and allowing himself to hit the high fly flow to the floor, wiping out Naito. Naito grabbed Tanahashi’s arm and slingshot it, sending Tanahashi to the floor in pain. He followed with a dropkick, again on the center of the injured arm. He hits Gloria and went for the Destino next but instead Tanahashi countered with a German suplex. Naito went for a super hurricanrana off the top rope, but Tanahashi rolled through with a cradle and got a near fall. Tanahashi fought back against a dragon suplex attempt, sidestepped Naito and hit two slingblades. He hit one high fly flow, but missed a second one. Naito went for a satellite DDT, but Tanahashi grabbed Naito’s leg and sent him to the floor with a dragon screw. He wrapped Naito in the Texas Cloverleaf. Naito struggled to make it to the ropes, but eventually made it. At the 25 minute mark, Naito hit the Destino, then went for a second but Tanahashi hit three twist and shout neckbreakers. Tanahashi hit the ropes for a sling blade, but Naito fired back with not one, but two Destinos to win the A Block. 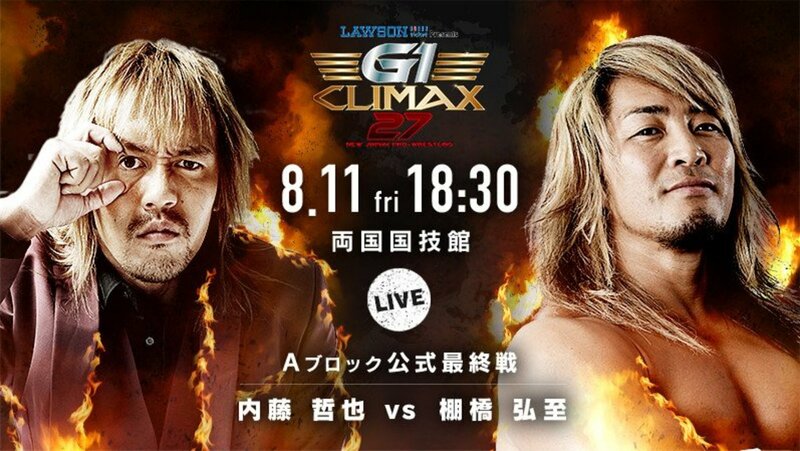 Tetsuya Naito is the first person to advance to the G1 Climax 27 finals. He cut a shot promo, including the LIJ roll call, to end the show.